I’ve decided to eliminate the runaround and go with a more prototypical track arrangement. Especially “The Hole”.I’ve also changed the name from the fictitious Oriental Lead to prototypical Industrial Lead. 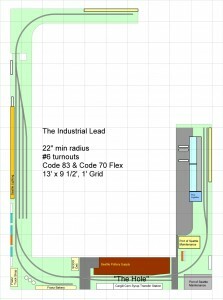 I am designing a modern day HO industrial layout. The layout is inspired by my experiences railroading in Seattle. It will feature Seattle industries that I am familiar with and have worked at as a railroad engineer. 70-20 Reefers because these things look awesome tagged up and weathered. Pressure Aide Hoppers. I see alot of these. Corn Syrup tank cars. Sweet. “The Hole”. Cargill’s Seattle Corn Syrup Transfer Facility. This is at BNSF’s 2nd Ave or Occidental Yard. This place is a dead ringer for the Pikestuff Transfer Dock. It get’s tons of BNSF 82′ reefers. I’ll probably do it with 70-20 reefers or Trinity 64′ reefers. This is on 5th Avenue on BNSF’s 7th Avenue Lead. It’s a great looking building and gets lot’s of hoppers. All of these industries are in Seattle’s SODO area. They are all off of different leads and served by different jobs, but all of the jobs work out of BNSF Stacy Yard. 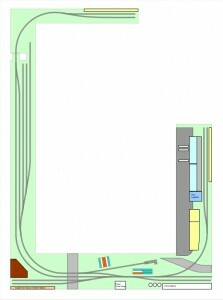 I’ve started with a track plan. The plan includes the industries I mentioned plus a team track (still working on this idea). The plan also includes a small yard, because I want to have a place to take the cars to. I’ve oriented the plan to share as much lead and tail track as possible. Most of the leads are sufficiently long to accomodate the associated industries full compliment of cars (Except Cargill). The shelves are 20″ deep on the South and East sides. 14″ deep along the West side and 12″ deep on the North side. The actual construction will be a combination of free standing benchwork and shelves. Track will be primarily Peco code 83 Flex and #6 Insulfrog turnouts. ME code 70 Flex and #6 DCC Turnouts. DCC control. One block. 24″ minumum radius. Locos will be goats and geeps and maybe SD40-2 if it runs OK through the 24″ radius turns.